Martin Kasík (b. 1976) ranks among the foremost Czech pianists of the present time. He has devoted himself to piano playing since four years of age. He studied with Monika Tugendliebová at the Janáček conservatory in Ostrava, and subsequently with Ivan Klánský at the Academy of Music and Performing Arts in Prague. The winner of several domestic and international contests, and the recipient of a number of prestigious awards, he has to his credit laureateships from the 1998 Prague Spring International Music Competition, the 1999 Young Concert Artists Competition, the 2000 Davidoff Prix, the 2002 Harmonie Magazine Award, and other distinctions. He has appeared in many major concert venues, such as the Berlin Philharmonic Hall, Wigmore Hall, the Tonhalle in Zurich, Gewandhaus Leipzig, the Concertgebouw in Amsterdam, Rotterdam´s De Doelen, Finlandia Hall in Helsinki, the Auditorio de Barcelona, Carnegie Hall´s Weill Recital Hall, Alice Tully Hall and Avery Fisher Hall, the Kennedy Center in Washington, D.C., Tokyo´s Suntory Hall, Victoria Concert Hall in Singapore, and others. As a soloist, he has appeared with, among other orchestras, the Chicago Symphony Orchestra, Minneapolis Symphony Orchestra, Deutsches Symphonie Orchester Berlin, Tonhalle-Orchester Zurich, Stuttgarter Philharmoniker, Rotterdam Philharmonic Orchestra, or Helsinki Philharmonic Orchestra. 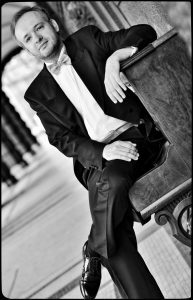 He has worked regularly with the Czech Philharmonic Orchestra and the Prague Symphony Orchestra, which he accompanied on their tours of the United States and Japan. Since 2009, he has been teaching piano at the Prague Conservatory and Academy of Music in Prague. His discography comprises 10 CDs for Supraphon and Arco Diva labels. ‘Mr. Kasik plays with a resourceful technique, fluidity, a keen sense of colour and intelligence.